The History of Civil Rights in America and how it has impacted Chicago. Civil Rights as a tool of resistance to deculturalization. What were the reasons behind the Civil Rights movement? What were conditions like for African-Americans in Chicago before the Civil Rights movement? How did the King Riots in Chicago and its effects on African-American neighborhoods? What was the “Great White Flight” in Chicago and why did it happen? What is the legacy of the Civil Rights Movement? Social and historical awareness of the role of race in our society both historically and presently. Write down questions and/or make observations that will be then discussed in class. ·Using Technology - Use appropriate instruments, electronic equipment, computers, and networks to access information, process ideas and communicate results. Working on Teams – Learn and contribute productively as individuals and as members of a group. Making Connections – Recognize and apply connections of important information and ideas within and among learning areas, e.g. Art, English. Help student make the connection between issues within their local community, at national level and worldwide. Students are able to write a structured essay using logical argument. Students should learn the skills of critical thinking and debating and presenting in front of classmates. ·Have students read in class primary source material of individual experiences of racism and of the Civil Rights movement. 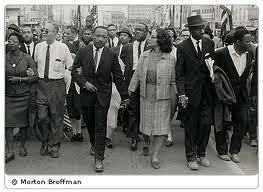 Write short descriptions of what their understanding of the Civil Rights Movement and why it was important. Have students voice their opinion and views of the importance, successes and failures of the Civil Rights Movement. Look at and discuss images from the Civil Rights era such as photographs, paintings, protest posters, etc. Open class with a short introductory lecture – Failures of Reconstruction. Background to Civil Rights Movement. Direct and challenge students to think about the successes and possible failures of the Civil Rights Movement. Is poverty levels and unemployment with African-American communities high or low in the aftermath of the Civil Rights Movement? Why? ·“The Narratives of Fredrick Douglas" by Fredrick Douglas.